This content marketing guide has been created specifically for those new to the practice who are looking a clear understanding of what this highly strategic marketing approach involves, taking readers through the entire content marketing lifecycle, with a particular focus on research and planning. Content marketing is all about creating content that is of real value to your potential customers with the underlying intention of motivating them to take a particular action. This action is any interaction with your brand that drives profitability – whether it’s sharing your content with their network, signing up to your newsletter, purchasing your latest product or writing a review. Content marketing is one of the most versatile tools in the digital marketing tool belt; it can take on a host of different topics and formats and be developed to impact any stage of the sales funnel. This versatility can lead marketers astray –many fall into the trap of producing content for content’s sake, prioritising volume over the quality and targeting of their output. Having a content strategy in place is essential if you want to see your efforts generate meaningful ROI. “Content marketing is not about “what you sell”, it’s about “what you stand for”. Effective content marketing is fundamentally about attracting and retaining customers. It can be used to accomplish all sorts of objectives, from driving awareness and consumption at the top of the sales funnel, to creating brand ambassadors and a loyal customer base at the bottom. With every piece or series of content that you produce, it’s important to have clearly defined objectives for what you want you to achieve. This will not only help to steer content ideation but also enable you to properly track and measure success. Who’s Winning at Content Marketing? To get a clear idea of what good content marketing looks like, here are a few examples of brilliant and award-winning campaigns from various industries. GoPro’s approach is focused on creative storytelling rooted in action and adventure, putting the lifestyle associated with their product at the heart of their content marketing. Covering topics across wildlife, sports, music, travel and family, their phenomenal video and photographic content showcases aspirational lifestyles around the world. GoPro’s goal is to empower users to make their own content, to creatively tell their own stories. This has led to the brand sourcing a significant amount of their content from users and sponsored athletes, as well as their own dedicated media team. GoPro’s YouTube channel contains more than 34,000 hours of footage, gaining them 2.34 million interactions. Their Instagram channel has 6.8m followers, averaging at 70,000 new followers a week in 2014. Communications agency Lowe Campbell Ewald are behind Project Architeuthis, an alternate reality game (ARG) created for the Navy with the aim of identifying quality candidates for Navy Cryptology. A successful Cryptologist requires a highly specific innate skill set, and as such recruitment concerns an extremely small target audience – less than 1 in 2,500 Americans. The game was conceived to draw out these highly niche candidates from the masses. It tells the story of a kidnapped engineer and the brave cryptologist who snuck aboard the enemy ship. Across 18 days, players are sent clues embedded in coded messages from the stowaway cryptologist – each leading them closer to the enemy base and the location of the engineer. The project is a brilliant example of the potential of gamification as a tool for creative storytelling and successfully targeted audience engagement. Launched on the Navy’s Cryptology Facebook page, the game attracted thousands of unique players without any paid media promotion and drove a 25% increase in followers. A community formed through players creating their own forums, groups and hashtags to support each other’s efforts in solving the puzzles. Ultimately, the campaign was a success, with the Navy achieving their recruitment goal. Un Illustre Inconnu is a French film about a man who copies the identities of others. Thinking outside the box on this one, the team behind the film drummed up huge press coverage when they cloned the Facebook profile pages of 40 influencers – playing directly on the film’s themes of identity and duplicity. The only difference between the real profiles and the clones were the eyes in the individual profile pictures. The eyes in the cloned pages belonged to Mathieu Kassovitz, the film’s leading man. Going beyond your average storytelling, this approach crash-landed the stunt’s targets into the middle of the film’s underlying conversation, forcing them to experience first-hand the vulnerability of our digital identities. The campaign generated over a million pounds’ worth of press media coverage, despite its complete lack of media budget, reaching 10 million people in total. Your Content Strategy: Where to Start? Now that you have a sense of what content marketing is and how brilliantly versatile it can be, it’s time to look at how you go about putting together your own content marketing strategy. Industry thought leader Kristina Halvorson’s book Content Strategy presents the following framework for developing a content strategy – applicable to both digital and offline content production. It offers a clear sense of exactly what you need to consider when developing a core content strategy for your business. Substance is the part of your core strategy where you lay out exactly what kind of content your business needs to produce and what core messages you want to communicate. Substance should be rooted in a clear understanding of your business objectives and the needs and interests of your target audience. It covers where you intend to source your content and what shape it will take. What do you want people to take away from your content? What is the objective behind each piece? Where will your content come from? Structure is how your content is to be formatted, organised and displayed. This includes determining where the content is to sit and how you plan to communicate its existence. What formats will your content take? Where can you reach your audience? How will users navigate your content? Which channels are best for starting a conversation with your audience? How will your content be linked to? What metadata and tags will you use? Workflow is the matter of laying down your content production processes, identifying the tools you want to use and the people needed to drive content campaigns that produce successful results at high quality. Who on your team is responsible for what? Where will your source materials come from? How will your content be published and will this affect the format? At what stages does your content need reviewing and approval? Governance answers the question of who the key decision makers are when it comes to your content and content strategy. Who ‘owns’ your content strategy? Who makes the final decision on a piece of content? Who is responsible for your strategy? Who provides the style guide? Who is responsible for reviewing and evaluating final products? Who determines the workflow and processes? Who measure the success of a campaign? The very first step of the content lifecycle is essential to ensuring your content is relevant and highly targeted to your audience and business needs. As Curata emphasises in their framework, your content marketing campaigns should exist to serve your marketing strategy, which should, in turn, be firmly rooted in your company’s business objectives. You could be looking to trump a leading competitor, increase the sales of a particular product, or increase your share of a new market. Whatever your company’s objectives, your marketing strategy and therewith your content marketing strategy should all point back to one or more top level objective. What are your overarching marketing themes? A solid understanding of your company’s cross-channel marketing strategies and the core themes underlying the different marketing drives is a very important starting point when planning a content strategy. With this understanding, you can develop content marketing campaigns that reinforce the story underlying each marketing theme and solidify your brand narrative. Once you’re clear on what your business and marketing objectives are, your content marketing campaign can be conceived within the relevant specifications and measured against the right metrics. Unless you’re starting a brand new website or are blessed with managing a very small one, it’s highly likely that you’ll have existing and legacy content to reckon with. Conducting an internal content audit is key when building a new strategy. It’ll provide you with all-important insight into the scale, quality and architecture of your site in its current state. Content audits are flexible and can be designed to reflect your aims for the project. If you’re looking for a quick and clear overview of the volume, complexity and performance of your content, a quantitative inventory of your site could suffice. This would involve creating a catalogue listing content location, format, page type, traffic, bounce rates, social shares, links and whichever other elements and qualities are of interest, such as word count, readability score, author and date. A qualitative audit, on the other hand, involves a more granular and manual analysis of your site content. While this undoubtedly requires greater time investment, it’s highly beneficial for sites that need a more in-depth understanding of their content quality, user friendliness and messaging. There are certain questions you need to be asking to ensure that you have a real understanding of the types of people your audience is made up of, what their interests and needs are, and where they typically consume information. Where can your online audiences be found? What content topics and formats do they share? Which sites/newspapers/magazines do they read? When is the best time to reach/engage them? Who and what is influencing your audience? What conversations are they having? Influencers are key stakeholders in content marketing, both as potential contributors and as powerful endorsers and distributors of your content. Influencers can be found in many places and in many forms, from popular subredditcontributers and bloggers to celebrities, journalists and industry experts, not to mention friends, colleagues and family. Considering how to make your campaign appeal to or involve the right influencers in your content piece can help you to lock down support from the start. If you’re looking for influencers on social media, Topsy is an excellent and free tool. It’ll allow you to gauge trends and identify key industry experts, personalities and outreach targets. Similarly, Followerwonk can be highly useful for identifying top influencers currently following you or any of your competitors. You can compare audiences, identify top tweets and discover information about when best to reach your audience, what their interests are and how authoritative they are on Twitter. Keeping an eye on what your competitors are up to can help you to improve all areas of your marketing efforts and content production: know their strengths; know their weaknesses. How is their site and content organised? What content formats are they using? How do they position their brand identity and voice? How do they interact with their digital communities? How is their content performing? There are a number of different ways you can approach researching your competitors. You can undertake a competitor site audit – gathering what detail is available and analysing the content of their websites in a similar fashion to your own content audit. Tools such as Buzzumo and Ahrefs are highly useful for discerning the most linked to and shared content on your competitors’ websites, as well as the social channels where their content performs the best. To keep continuous tabs on your what your competitors are up to, set up mention alerts through Google or services like Talkwalker. Creative planning is the application and transformation of the relevant knowledge and specifications you have for a campaign into the form of a product or series of products communicating a particular message. For us, this is a highly collaborative effort, bringing researchers, creative leads, designers and developers together to discuss and develop new ideas. Looking for stories that will work for your audience and objectives is a challenging thing. We can benefit a lot from borrowing approaches used in feature journalism, some of which are outlined below. A natural starting point is considering the topics that are in demand from your audience, which you should understand from your research. Tapping into communities and exploring the conversations that spill from one community to another shows a topic has relevance for a wider audience. Once you have a general topic area pinned, it can be tricky to nail down the exact approach you’re content is going to take – what’s the angle, argument and story you should adopt? A popular (and fairly British) litmus test for an idea is whether it’s the sort of thing you can imagine friends talking about down the pub. 1. Go behind-the-scenes and dig out something unknown or surprising about an experience. Look for the ‘why’ behind an event, norm, behaviour, concept, myth etc. Even better: Disprove a common assumption. Telling your audience something they don’t know about something that they take for granted – such as a social norm, a popular product or a concept – is a great way to create content that starts conversations offline. One popular and very simple approach of this style, which went viral this year, is the What Happens One Hour After Drinking a Can of Coke graphic from The Renegade Pharmacist. 2. Create content that is in some way organised around identity, that tells readers something about themselves or people they know. UK editor of Buzzfeed, Luke Lewis, gave an example at an event on viral content of an article about a man who went to Australia to visit a little girl who suffered from the same genetic condition as he does, Treacher Collins syndrome. Initially, the article struggled to perform, so they tweaked the headline to include an identifier, stating that the man was from Yorkshire. It went viral. Why? People from Yorkshire felt more connected to the subject and were more predisposed to sharing the content with their networks, giving it that initial push needed for the piece to pick up across audiences. Identity played a key role in why and how ‘The Dress’ became a viral phenomenon, which centred around the apparent subjectivity of perception – some of us saw gold and white, and others blue and black. Two camps of perception emerged (complete with hashtags), along with a flurry of questions as to how this might be possible: why on earth can’t the person sitting next to me see what I’m seeing? What did it mean about my mind? Cue dozens of new content pieces from all sorts of sources offering scientific explanations of the ‘why’ behind the experience. Nostalgia was once considered a psychological disorder, but is now considered a tool of our neurological defence. Sentimentality for the past is universal, and as such it’s no real surprise that content with a nostalgic hook appeals to broad audiences. 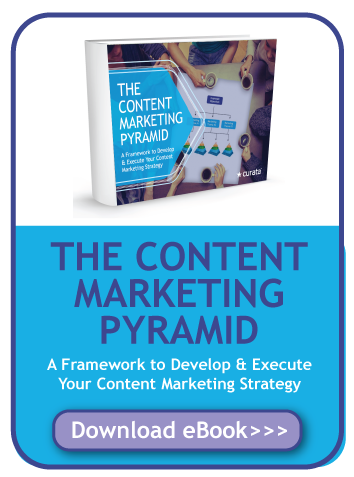 Personally, I’m a fan of reflecting on Curata’s Content Marketing Pyramid when mapping out a content campaign. The simplicity and clarity of its structure can help you to ensure that there’s a clear focus across content and that each piece serves a clear aim that feeds back into your brand objectives and sales pipeline. At the top of the pyramid are your heavy-weight content pieces. These are your core assets and require the highest level of investment – both financially and intellectually. Your core content should be big ideas that embody your brand’s vision, values and key messages. Often brands will keep these assets gated – requiring users to submit their email addresses to gain access, therewith generating leads. At the middle of the pyramid lie derivative assets. These are your mid-budget content pieces rooted in source material from your core content. There should be enough insightful, entertaining or useful content and meaning in your core asset to provide a basis for multiple derivative content pieces that each focus in on a distinct key message. The aim of derivative assets is to improve accessibility and engagement with your core content messages by diversifying the formats through which they are communicated. The latter two – contributed content and blog posts – are typically produced at a higher rate than the other types of derivative content. At the bottom of the pyramid is your low-budget micro-content, produced at high volume and largely focused on promoting derivative and core assets. These include all social media activity, curated content, newsletters, blog comments and any participation in blogs or forums that may be suitable for your brand. Reuse and repurpose messages from your core content pieces and use micro-content to experiment with messaging styles, headlines and engagement strategies. Twitter’s recent introduction of polls is an excellent new means of gauging audience opinion before committing to a headline or approach in your next core asset. Each campaign should, in theory, consist of one core asset accompanied by a proportionally larger number of derivative assets, followed by a high number of micro-content posts. All of this can and should be planned out and documented ahead of production to ensure efficacy and message consistency. For marketers looking to launch or refocus a blog, an editorial calendar rooted in insights from keyword and audience research is a useful tool for planning ahead. When creating your calendar, bear in mind that lower level derivative assets and micro content should remain flexible. That way, you can respond with agility to current events and trending conversations that relate to your core asset and brand proposition. If this type of calendar doesn’t suit your needs, do always ensure that you document your strategy in some form so that you have a resource you can return to for clear guidance and use to evaluate over time whether your efforts are still on track. Making content for content’s sake is a common mistake. Keeping your campaign objectives at the forefront of your format decision-making is a good way of ensuring that everything you produce exists for a purpose. It also provides a clear outcome against which to measure the performance of your campaign. The objectives of your core content piece will be whatever is important to your business leaders – for instance, to generate leads or increase assisted conversions. Your derivative content could be aimed at improving your search visibility or increasing customer retention, driving people in the direction of your core content and its objectives. Micro-content might be tasked with increasing brand engagement and social referral traffic. Making these objectives as clear as possible and setting related hard and soft metrics and KPIs before production begins will help to keep everyone involved focused on the strategic purpose of each content piece, big or small. We’ll be going into a bit more detail about content metrics towards the end of this guide. When it comes to creating your assets, quality always trumps quantity. According to a recent survey by Acrolinx, 59 percent of respondents said that bad grammar and spelling mistakes would prevent them from purchasing from a website. Design is central to the above. Ensuring that your UX and design are well thought through, tested, and intuitive and that your style reflects the key message of your content are all considerations that will ultimately aid your audience’s interpretation of your content’s value. Curata state that 65% should be original, 25% curated and 10% syndicated. Whichever breakdown works for you, the key point here is that curating or licensing content is a common and important component of a complete content marketing strategy. Curated content is typically unlicensed usage of excerpts, snippets and extracts of content on other sites, repurposed on your site with a particular focus point. Buzzfeed is the kingpin of curated content, sourcing the material for their listicles from across the web. Curation is useful for pulling together lists of images, recommended articles, anecdotes and quotes. The catch is that you must link back to the source, and must only publish small extracts from the original source. It is, however, free. Licensed content, conversely, can be quite expensive, but it provides you with the rights to publish full-text articles written by professional journalists. It requires less manpower than in-house production but offers a reliably high standard of quality. Placing user generated content at the heart of a campaign can be highly effective means of brand building. User generated content has never been as prolific as it is today, and with the increase in smartphone and social media users, the number of people publishing photos, commentary, artwork and music online continues to grow. Meanwhile, Nielsen reports that consumer opinions posted online are the second most trusted sources of brand information. We tend to trust each other more than we trust an advert or branded product description. This is why user generated content can be so powerful. It implies a level of endorsement and consumer trust. A lovely example of how this can be implemented is Starbuck’s White Cup Contest. Across the US and Canada, customers were asked to doodle on their Starbucks cups and submit photos of their artistry to the contest. The winning entry would be printed on a limited edition Starbucks reusable cup. Nearly 4,000 customers entered the competition within three weeks, providing Starbucks with a huge library of user generated content to use as marketing collateral. Your next step is getting your content in front of the right people. The research and planning you will have undertaken as you formed your strategy should have identified where your audience can be found, what they tend to read and who their key influencers are. You should even have an idea of when they are most active online. First and foremost, before getting into distribution, you’ll want to make sure you’ve optimised your content so that it helps distribute itself as far as possible. Then you’ll need to be proactive, submitting your content to relevant publishers and engaging influencers and audiences directly through outreach, social and email. Below are a list of (more or less free) tactics and considerations to help increase your chances of success. While click-bait titles make my soul cry a little every time I read one, there’s no denying the power of a strong and attention grabbing headline. Come up with a few alternatives and consider a/b testing titles on Twitter. A bit of mystery can be effective, but don’t mislead or over-promise in your title – nobody likes to be tricked. Making sure that share buttons are clearly visible, preferably at the top of your content pieces, will encourage people to take action. Remember to include social mark-up that is aimed at inviting interaction – this means always including an image. A clear and targeted title tag will help your content to rank on search engines for relevant keywords. Including a targeted meta description and keywords in your headers and alt tags is best practice, but steer clear of keyword stuffing. Internal linking can help encourage site visitors to engage with a specific content piece. If the content piece is of high importance, linking to it from your homepage is the most effective way of driving traffic its way. Alternatively, links from relevant landing pages or from popular past content pieces can be useful ways of encouraging viewers to stay on your site to peruse new content. If your site meets the requirements, successfully submitting your content to Google News could give its organic performance a powerful boost. Read through the requirements thoroughly before attempting a submission. Contacting journalists and bloggers who have previously demonstrated interest in your topic is one of the most effective ways of having your content seen and shared by the right people. Tweet and retweet your content several times on the day it’s published and continue to share it throughout the coming week or two. Retweet older content pieces intermittently to rekindle interest. Upload visuals to Slideshare, Instagram and Pinterest, be active on YouTube and consider how you might be able to engage through popular apps – such as Snapchat and WhatsApp. Content with an emotional hook performs better on Facebook than Twitter. Avoid repeatedly sharing the same content on Facebook within a short period of time though – while this is encouraged on Twitter, Facebook audiences are less forgiving of seeing the same content from the same source in their newsfeeds. While not a free tactic, you may want to consider social amplification tools, such as Outbrain or StumbleUpon, to help give your posts on social channels a boost. Where relevant, feature your content in your email newsletters or similar comms to your mailing list. If your mailing lists are broken down by persona, you’re in a great position to target the distribution of your content pieces to the right audience segment, increasing the likelihood of engagement. If you really want to grab the attention of a particular influencer – say a journalist at a prominent newspaper – consider thinking slightly out of the digital box. If you’ve developed a visually led content piece – such as an infographic or photography series – printing the asset and sending it to them by post is a sure way of standing out from the content crowd. Wrapping a box of chocolates or the likes in a print of your work also can’t hurt. You should already have soft and hard metrics outlined for your content pieces and overall campaign. Your soft metrics will be focused on measuring engagement, interaction and brand awareness. Hard metrics make up your lead generation and sales impact. Create a document that allows you to track these over time—it’s a useful way of measuring and comparing the performance of individual campaigns, helping you to continuously learn from experience. This can be as simple as creating a dedicated spreadsheet. What you measure will depend on the objective of your content piece. Below is a table with an overview of common metrics for measuring performance at different stages of the sales funnel. Assigning a set value to different actions that don’t directly produce revenue (e.g. number of social engagements, email sign-ups, etc.) will help you to evaluate and score the overall success of your campaign in a clear way. Remember to set targets – what is the ideal score for each metric? Content Marketing is a long-term game. Don’t expect to move mountains with your first few pieces. Building up a reliably high-quality body of work that clearly communicates what your brand stands for and the expertise it has to offer takes time. That being said, it’s important to remain agile and respond to the performance of your content.If a piece isn’t performing as well as expected, is there anything you can do to it to give it a slightly different angle or a new push? Try alternative calls to action, test different headlines and even try swapping your imagery. Is the content copy too dense and hard to read? Are there enough visuals? A small change can make a big difference, as Buzzfeed demonstrated with their ‘Yorkshire’ title tweak (explored above). At the same time, though, there is no point in flogging a dead horse. Use your judgement to ensure you’re making the best use of the resources available to you. Your content needs to be current and relevant. Consequently, the vast majority of content pieces operate on a finite lifespan.Once a content piece no longer experiences traction, a decision will need to be made as to whether it’s time to renew it, archive it or outright bin it.You will need to be clear on whose decision this is and what the criteria that you wish to work with are when it comes to dealing with content at the end of its lifespan.Similarly, you will need to determine how regularly you intend to redevelop your strategy and who is to take ownership of both it and your new campaigns. Rest assured that once your content marketing ball is rolling, you won’t want it to stop. Content Marketing Institute: What is Content Marketing? Halvorson, Kristina. “Content Strategy For the Web”. 2nd Edition. 2012. Jones, Colleen. “Clout: The Art and Science of Influential Web Content”. 2011. Dani leads our data informed approach to content strategy here at Builtvisible, making sure all our content projects are rooted in both the needs of the business and the interests of the target audience. Her love of dogs, fascination with the theatre, singing ability and background in social anthropology make her an excellent drinking companion.